One Stone students have spent the last 12 weeks engaged in Design Labs (aka DLabs), going through the steps of the design thinking process in order to solve problems that impact individuals and organizations in our community. Students worked in conjunction with community partners who each presented a challenge that their organization is facing. For example, the Idaho Botanical Garden wants to make their grounds more accessible to people with physical disabilities or visual impairments. Happy Family Organics seeks to reduce their carbon footprint. Parents shouldn’t be texting while driving. The Boise Arts and History Department would like to see more teens participating in the local arts community. The process began back in September when students visited with representatives from each partnership to hear about the problems at hand. They listed their top choices and were assigned to groups accordingly. In their first DLab meeting with clients, students listened in order to understand the problem from the client’s perspective and empathize with their challenges and need for change. Next they had to create a prototype, test it, and then implement their solution. The prototype wall at One Stone holds an assortment of raw materials. I’m blown away when I think about all the real-world skills One Stone students develop by working through the design thinking process with their clients. And I’m convinced that the only way to learn and acquire these skills is by going through the entire process from start to finish. engage with community members, listen attentively, and see a challenge from someone else’s perspective. identify and define a problem. be vulnerable and take risks in sharing their ideas, while accepting others’ ideas, too. visualize a problem and take collaborative steps to solve it with a unique creation or approach. design, implement, and adhere to a plan. present their ideas to clients so that they (the client) can determine if the solution is a viable one or if it needs to be re-worked. follow through on plans, fail forward when something doesn’t work, and develop grit to get through the most challenging of situations. 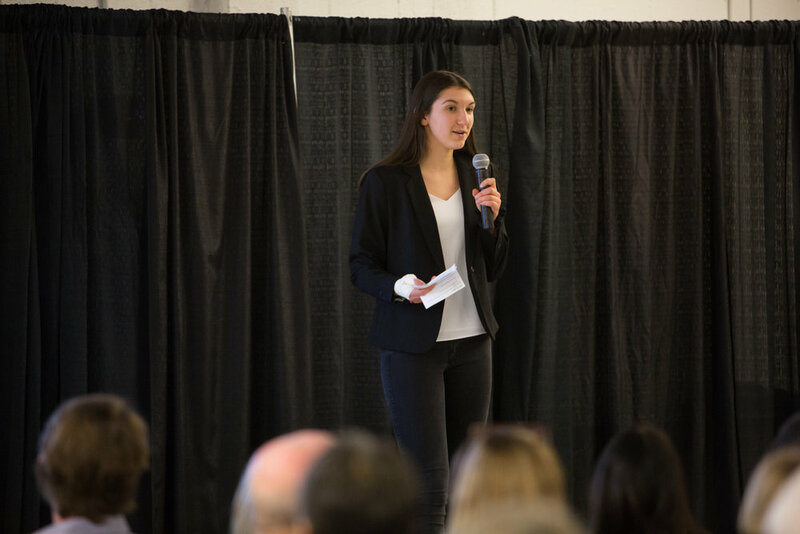 walk up on One Stone’s stage with their teammates and present their work to more than 150 people including peers, parents, grandparents, coaches, neighbors, community partners, and other guests. So, be ready to be see what happens when students disrupt for good. You might notice things like higher attendance rates at the Idaho Botanical Garden, organic baby food available in the bulk food section of the grocery store, a new gaming app that discourages texting while driving, and more teenagers sharing their talents in the local arts scene. Just to name a few. If your organization could benefit from our design thinking process, we’d love to hear from you!  Please contact our amazing opportunity wrangler, Neva Geisler. 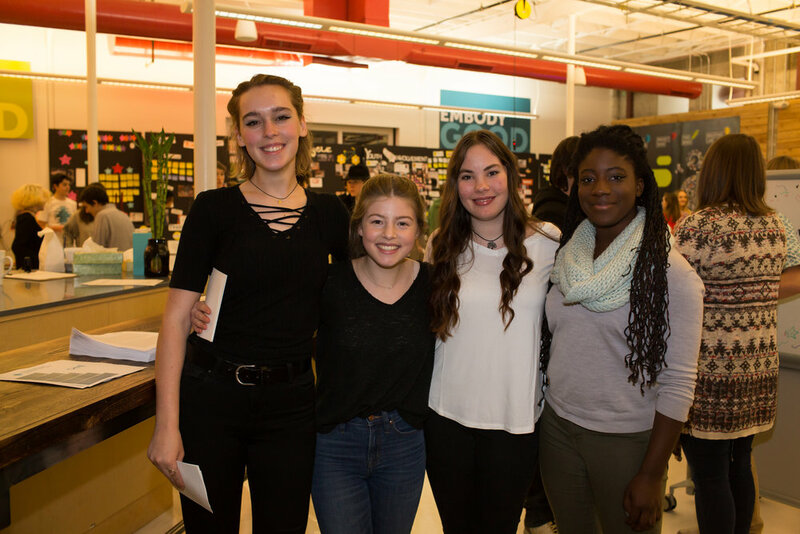 We also have lots of options if you’d like to learn more about our tuition-free private high school, schedule a tour of our facility, attend our Spring 2018 Disruption Day presentations, or get involved in any of our after school programs as a student participant or an adult volunteer: Project Good—our experiential service program, Two Birds—our creative studio, or Solution Lab—our idea incubator. Come join us in disrupting for good! A design team poses before their ramp prototype for Idaho Botanical Garden. 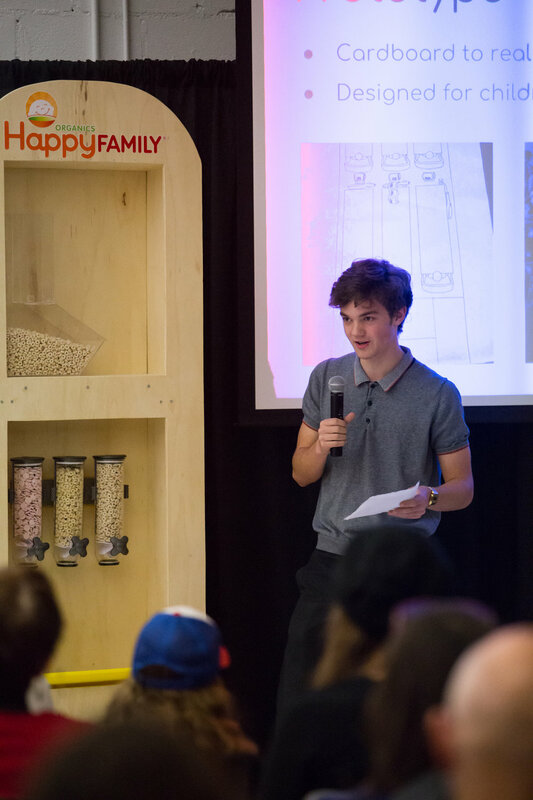 A One Stone student presents the prototype for Happy Family Organics bulk food dispensers. Students celebrate disrupting for good. In typical One Stone fashion, the evening was student-led and directed by One Stone student MCs. Members of the audience applaud a design team of students. 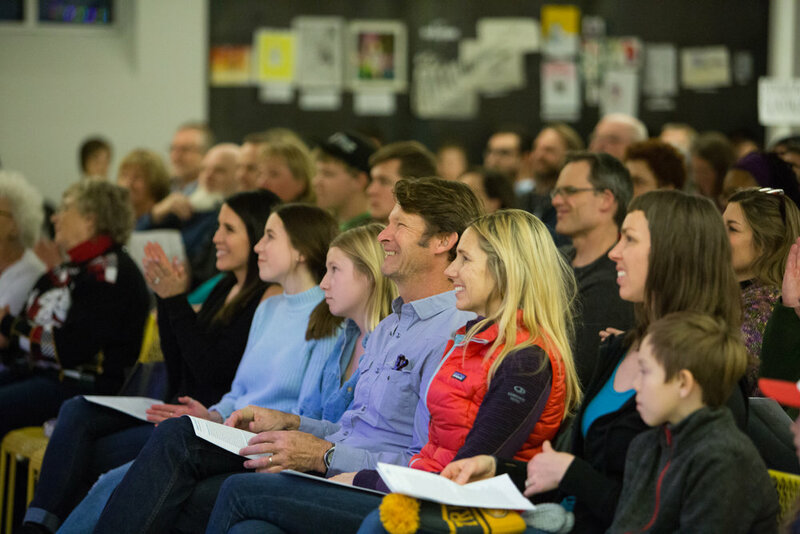 Teresa Poppen, One Stone’s executive director, seated with her husband and daughter, smiles upon seeing the growth and contributions students have made. 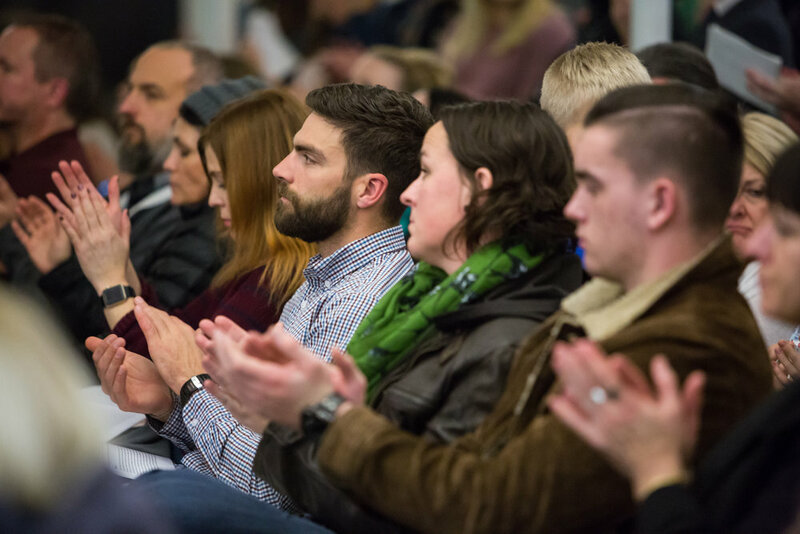 More than 150 people attended One Stone’s Disruption Day presentations.